Kullu is known amongst tourists as the valley of gods. 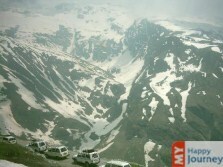 It is a breathtaking place, with picturesque views, situated in the state of Himachal Pradesh. Kullu is located approximately 1230 meters above sea level and is enclosed by the great Himalayas on one side, while River Beas flows on the other. The town of Manali is housed in the lap of Kullu valley and the best thing about Manali is its proximity to snowline. Some of the famous temples here include Raghunath Temple, Bijli Mahadev Temple, Jagannathi Devi Temple and Basheshwar Mahadev Temple. These temples are dedicated to different gods and goddesses. Tourists praise these temples for their unique and intricate styles of architecture. Other places of interest are Sultanpur palace, also known by the name Rupi Palace. The palace lost its original charm after being a victim of an earthquake in the year 1995 and was reconstructed later on. Kaisdhar, Deo Tibba and Raison are other worth visiting attractions and can be reached via trekking, as these are located in the center of deodar forests. River rafting, trekking, paragliding, hiking and mountaineering are a few famous adventurous activities performed here. Trekking trails of Ladakh valley, Zanskar Valley and Spiti along with those in Lahaul are quite famous amongst trekkers. One can get hands on experience of fishing in River Beas. Solang, Mahadev and Bir are a few sites idealistic to engage in paragliding. For mountaineering, visitors can go to Deo Tibba, Beas Kund, Malana, Hanuman Tibba and Chandratal.